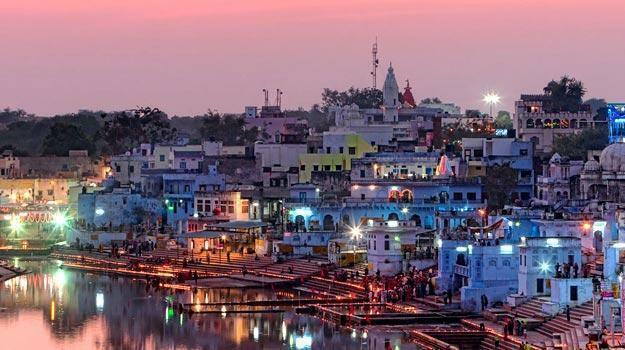 Pushkar - Tirtha City, is one of the oldest and sacred city where Hindu devotees performs their rituals and take holy bathe in Pushkar Lake. It is positioned in the Ajmer city of Rajasthan amidst between the slopes of Rajasthan. It has renowned Brahma Temple. Connectivity of one place to another is good, there are local or city buses and shared taxis. The sand dunes around Pushkar can be best traversed on a camel. Taking ride through the desert atop a camel is an awesome experience. It's a rhythmical ride through the calm desert, the loudest sound being the plush of camel feet on the sand. If you want to know the life of people in the deserts talk to the camel man, they have the great experience and they always feel happy and enthusiastic while sharing their stories. During the time of camel fair one can grab the opportunity of hot air balloon ride early morning in soft rays of sun and capture the dazzling view of lakes and temples. Don't miss the visit to local markets, there is local market between the Pushkar temple and lake. City is famous for the leather work, bandini suits, block printed and carved handicrafts and brilliantly designed silver jewellery. Some of yummy tummy foods in Pushkar are Malpua and kachora (type of kachori filled with dal and large in size) at Sarweshwar at Mithai wali gali; Lassi that delicious flavour of Gulkand near the steps of Brahma Temple. Pushkar is a great place to visit only 144.9 km from jaipur. So if you want a break from your daily life Pushkar is best option to explore and get relaxed.